We believe our biggest competitor is in your house, therefore we understand that saving you time and money should be our primary objective. We offer affordable prices so that everyone can take advantage of our services. We always assume that customers are in a hurry and listen to their requests. We offer same day service Monday through Friday at all locations for items dropped off before 9:00 am; and some locations offer same day service until noon. We offer same day service in some locations on Saturday. 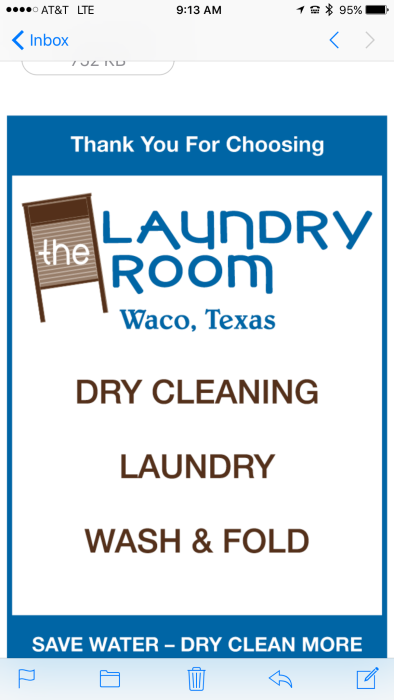 Cut off times for same-day service may vary by market, so check with your local Laundry Room. 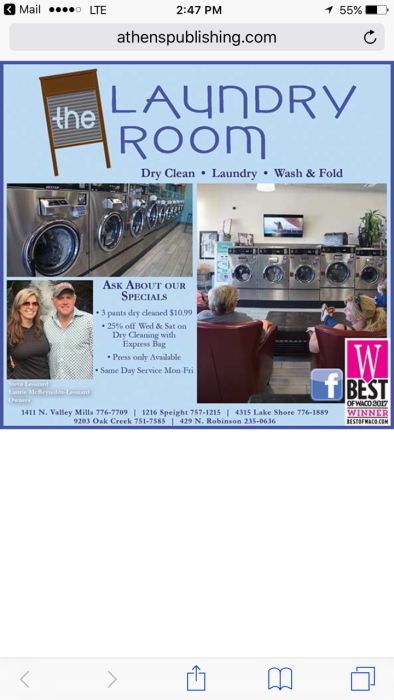 Laundry Room offer dry cleaning and laundry services. This includes professional stain removal, proper cleaning, and pressing. 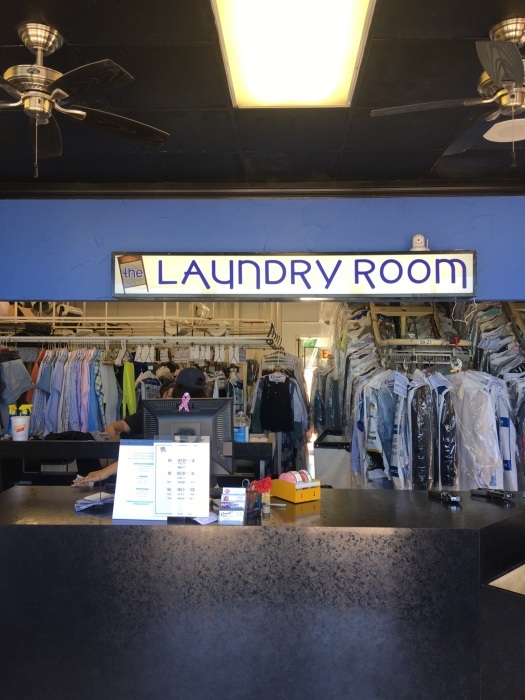 We clean all types of clothing including suits, dresses, sport shirts, wedding dresses, and silk. We also clean household items such as draperies, bedspreads, and tablecloths. We offer a convenient press-only service for those who prefer to clean their own items but want that professional finished look. 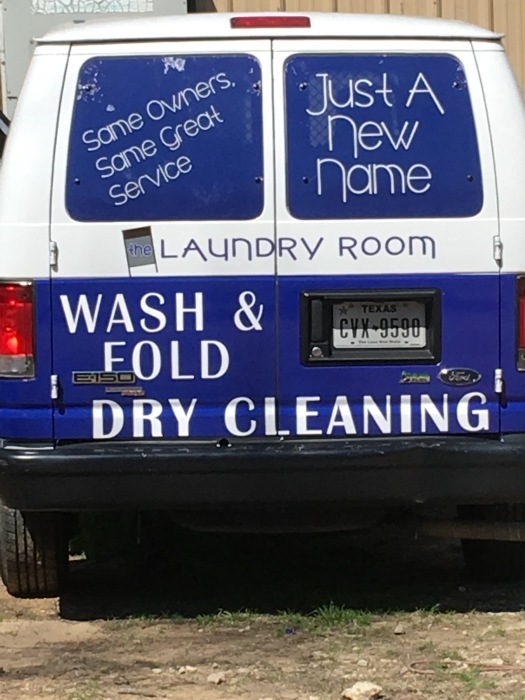 Laundered items can be starched to your preference. Buttons are tightened or replaced at no charge. Shirt sleeves, pants, and jeans can be creased or not creased per your instructions. Shirts can be folded or placed on hangers. Alterations are offered on site at some locations, but all locations can process your alteration requests. Alteration services include replacing zippers, size adjustments, hem repairs and adjustments, cuffing, and much more. Drive Thru -- No need to get out of your car. Let our friendly staff service you while you stay in your car out of the weather, with the kids, on the phone, or for whatever reason. Car Hop service available -- As not all locations have Drive Thru service, we offer car hop service at its inline shopping locations. 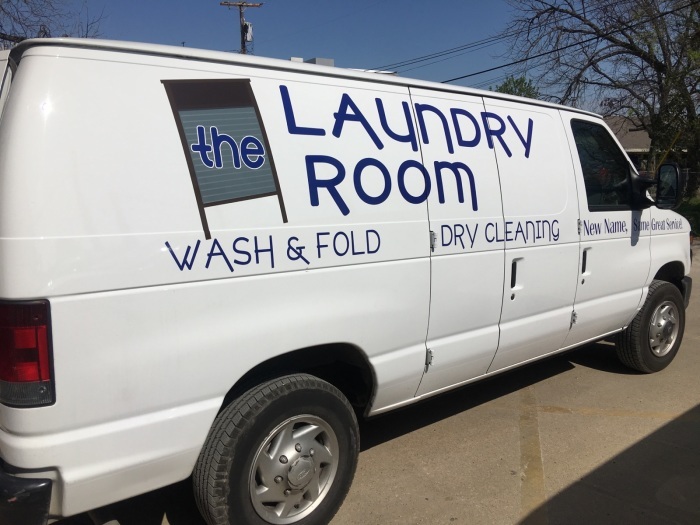 24 Hour drop off at many locations--We know you are busy and can't always get to the cleaners during normal business hours. Many locations have 24-hour drop boxes for your convenience. Express Bag Service -- As an added convenience, The Laundry Room has Express bags to make dropping your clothes off faster and more convenient. An Express bag is an easy way to collect your clothes at home that you need to bring toThe Laundry Room. Our roots date back to the early 1920's and we have been instrumental in the overall development of the drycleaning industry. 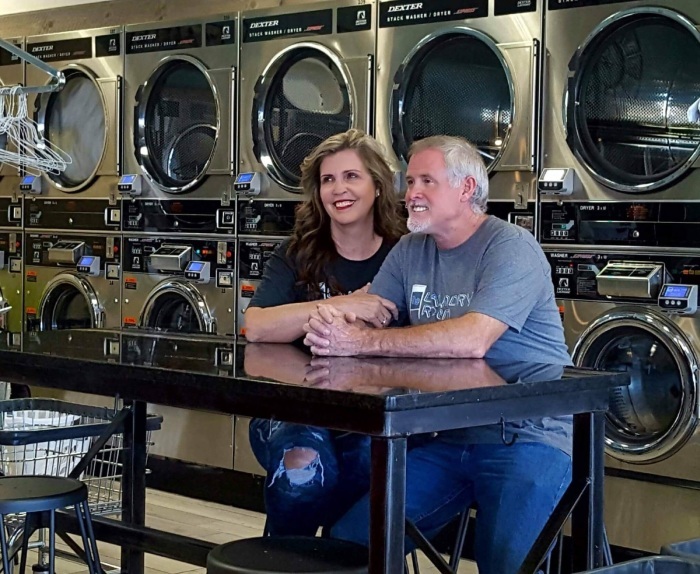 We have always been leaders in the advancement of new equipment along with modifications allowing The Laundry Room to have the best tools available to serve customer demand and needs. A clean, laundered, and pressed shirt is necessary when making your first impression. We would love to help make this possible for you. We launder hundreds of shirts every day.